I am currently working on this third book on dementia. These therefore follow on from my previous books ‘Living well with dementia: the importance of the person and the environment’ (CRC Press, 2014) and ‘Living better with dementia: good practice and innovation for the future’ (Jessica Kingsley Publishers, 2015). I am honoured that the book will have forewords from Prof Sube Banerjee, Professor of Dementia, who co-authored the 2009 English dementia strategy, Lisa Rodrigues and Lucy Frost. Whilst recent years have witnessed massive progress in dementia friendly communities in the UK and elsewhere, there has also been a greater scrutiny of ‘post diagnostic care’. 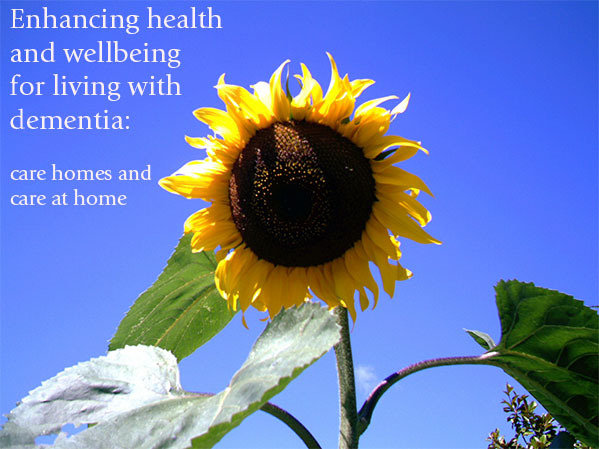 This book reviews the evidence for enhancing health and wellbeing for people living with dementia, and will be useful for anyone designing, researching or using these services. The quality of residential care settings is intimately related to the philosophy and culture of care, but there is growing recognition that residential homes are part of an extended system of the provision of healthcare including the acute hospital. People living with dementia are entitled to the best standards of health care, for both physical and mental health, but also need their life story and identity to be respected. The book concludes by evaluating critically what features of the healthcare system might be desirable to encourage independent living (including at home) and integrated health, and why palliative care and specialist nursing must be a key factor in the design of care pathways at both a national and local level. A detailed consideration of end of life care and life story, whilst introduced in this text, is beyond the scope of this book. They are covered elsewhere in detail by future books from Jessica Kingsley Publishers.